The Essex Regiment Chapel is located in Eagle Way, Warley (51.5991°N 0.2977°E). 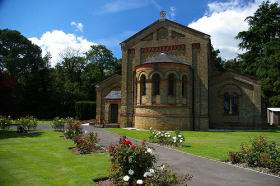 The chapel was built in 1857 and is a Grade II listed building. It was originally constructed for the British East India Company, but with the establishment of the Essex Regiment Depot at Warley, the chapel became the regiment's "home" church. The chapel's interior contains displays of regimental history, memorials, heraldry, and old regimental colours. The chapel is open by appointment, and on regimental heritage days. The Royal Anglian Regiment and its predecessors are fortunate to have several churches and chapels where regimental church services are attended by serving and former members of the Regiment; where Colours are laid up when replaced; and Regimental Memorials are erected. Regimental Chapels of The Royal Anglian Regiment are: St Mary's, Bury St Edmunds; the Chapel of the Essex Regiment and The Royal Anglian Regiment at Warley; and St Saviour's Chapel, Norwich Cathedral. It is unique in that the Essex Regiment was the only single regiment to have its own free standing chapel. The attractive and imposing interior with its rich display of Colours, memorials and pew ends encapsulates much of the history of the Essex Regiment up to the present day when it has been absorbed into the Royal Anglian Regiment. The Essex Regiment and the Royal Anglian Regiment maintain strong links with the Borough of Brentwood and the County of Essex. Area Office : HQ Royal Anglian Regiment.